Some drummers playing in power trios instinctively think in terms of filling up space, rather than creating it. Not so with the versatile Kenny Kramme, who gives The Joe Bonamassa Band a solid foundation, along with providing plenty of flash and drive. “I had a teacher early on who instilled in me the idea that space is a sound,” says the thirty-six-year-old drummer. Kramme grew up in Baldwin, New York and began playing drums at fifteen, first drawn to drummers Bonham, Paice, and Peart. He took lessons and played in jam bands, emulating the most musical of the 1980s progressive rock drummers, such as Journey’s Steve Smith—“guys whose playing was about the song, about the music,” Kramme says. Upon moving to New York in 1995, Kramme paid the rent by playing with up to ten different bands, sometimes two or three gigs a night. While touring with The Fourth Floor in 1997, he met a producer who introduced him to Joe Lynn Turner of Deep Purple and Rainbow fame. 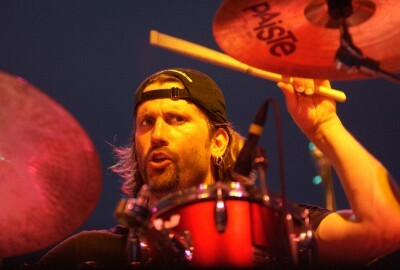 Kramme has since played on four of Turner’s recordings, as well as on sessions with Leslie West, Vernon Reid, and Andy Timmons.